By the looks of things; some South African political parties are finally waking up to the digital revolution and are beginning to embrace online marketing and its integration with offline media. From having a functional website, through to using social media like Twitter and Facebook – the times they are changing! Of course as with everything; there needs to be a balance and there needs to be integration between everything that is being done offline and everything that is being done online. Added to this in politics is the fact that different parties are trying to attract different sections of the market so we cannot look at their marketing strategies and assume that they are both targeting the voting public. So let’s look at arguably 1 of biggest horses in the Local Government Elections, 2011: The Democratic Alliance and their entrenchment with new media. 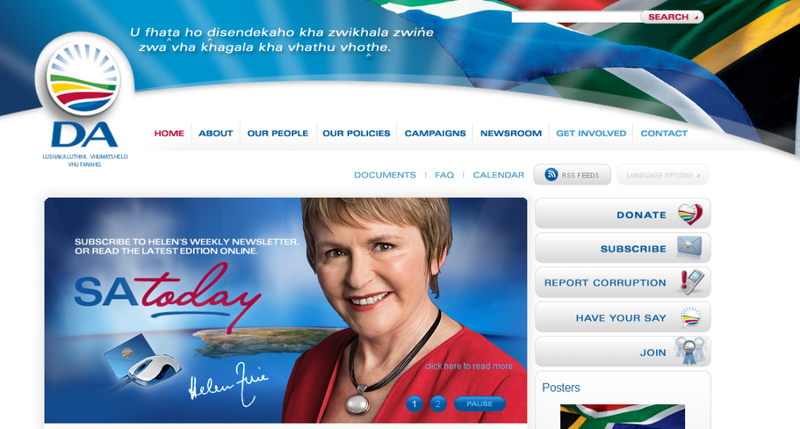 The DA website has a decidedly Barack Obama feel to it; especially compared to when he was running his last electoral campaign. build the country together without discrimination. Helen Zille has thrown herself into social media and opened herself and The DA up to the public. Allowing the public to interact, to ask questions and to most importantly voice their opinions. This social approach has definitely done the DA good as they have ensured that their campaign messages have been heard by a very important voting demographic : The Young South African! These social media users are literally the future of the country and it is a very strategic and brilliant move; in my opinion; that The DA have realised that this is where the elections will be won or lost. There are a number of DA Twitter profiles and personalities who are taking advantage of the media. There are Twitter profiles such as : DA News; DA_SA; votetowin and DA_parliament. Each of these profiles is pushing out information relevant to either the local elections; what impact the DA is having in government as well as general party news. Engagement is the name of the game in politics and social media is the perfect medium to completely engage with an audience in a way which has very quickly become second nature to young South Africans. From Facebook to Twitter and from Flickr to YouTube; the Democratic Alliance has ensured that they have not left any popular social media platform unattended. Online marketing and by extension social media are merely one channel of communication though and it is the integration between each of these channels which truly makes for a powerful campaign. once again the Democratic Alliance has echoed the last Obama campaign and has ensured that the offline voter has been catered for as well by using TV, radio, print and outdoor media to adequately enforce and repeat the major campaign messages. Good luck to all the political parties on voting day! But most importantly; good luck to South Africa! Remember, you can’t moan, comment or pass judgement unless you do your part and vote! Value is just teaching them to use you! Is Search Engine Optimisation becoming Search Optimisation?